Springfield Ohio has been called the City at the end of the Road, the Rose City and at the turn of the century it became know as the "Home City" because the number of lodges including the Masonic Lodge, Knights of Pythias and Odd Fellows that had built institutions for both orphans and aged members of their orders. In 2004 it was named as an All-American City but to the 140,000 that live here it’s just called home. Long before Springfield became a thriving commercial center it was home to numerous people. The earliest records indicate the area was home to Mound Builders. In more recent times relatively speaking, Shawnee Indians had several towns or villages in the area as they did in much of western Ohio. In the 1780s a group of Kentuckians that included the famous Daniel Boone, advanced on some Shawnee settlements that became known as the Battle of Piqua. In that conflict was a young indian that would later become one of the most famous Shawnee leaders. His name was Tecumseh Although the Battle of Piqua helped calm things down for a short period, there were other conflicts. In 1795 General Anthony Wayne lead another force through the area that ultimately led to the Treaty of Greenville. It would finally take the War of 1812 to bring a lasting peace to the area. The first European resident to lay claim to the land that would become Springfield, was James Demint who settled there in 1801 along the Mad River. In just 17 years Springfield was contesting New Boston for the county seat of newly established Clark County (named after George Rogers Clark, older brother of famed Lewis & Clark). State legislators awarded the honor to Springfield. Springfield got its name from the wife of Simon Kenton an early frontiersman with Daniel Boone, because there were so many natural springs in the area. Today, there is a memorial statue honoring Simon Kenton near Urbana, at Kenton's grave in Oak Dale Cemetery. In 1839 the National Road came to Springfield and and promptly stopped when the federal government ran out of funds to continue the cross-country road. It was then that Springfield became known as the City at the End of the Road and remained that way for 10 years. The railroad reached Springfield in 1840 and commerce began to boom. By the 1860s, Springfield had become home to one of the worlds leaders in agriculture machinery: International Harvester. It was Springfield lawyer, Harry Toulmin, that the Wright Brothers contacted to acquire the patent of their “flying machine”. As America grew so did Springfield, until the winds of change routed much of the National Road traffic to the interstates and industries began to leave as well. 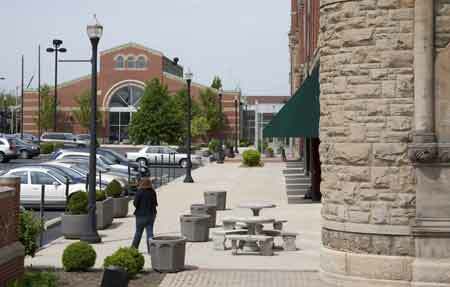 Today Springfield, like many cities, is adjusting to that change by reinventing themselves. Traveling through Springfield, you will see historic districts being refurbished—abandoned buildings are finding new uses. The Springfield community boasts one of the most vibrant arts and cultural environments for a city its size, anywhere in the country. Springfield residents have countless opportunities to enrich their lives through cultural events, programs, and activities. For outdoor enthusiasts, the area's many parks, rivers, trails, campgrounds, lakes and bike paths make it an attractive city to live and to visit. The people of Springfield are proud of their heritage and confident of their future. Springfield Ohio is a city you should know. 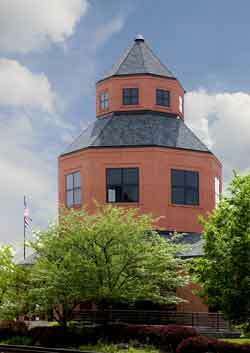 Wittenberg University located in Springfield, is a nationally recognized college for the liberal arts and sciences affiliated with the Evangelical Lutheran Church in America. Wittenberg's original focus was the training of Lutheran ministers. However, in recent years, Wittenberg's traditional strengths have been in the liberal arts, recently the sciences, management and education have also developed into popular majors for students. Eight thriving pre-professional programs contribute to the educational experience of Wittenberg students, with 70% pursuing graduate studies. With over 20 antique malls and one of the Midwest's largest antique malls, Springfield is the antique lover's paradise. Monthly, the Clark County Fairgrounds hosts the Springfield Antique Show and Flea Market, with the Extravaganzas in May, July and September. What Springfield used to be like with much activity and shoppers abundant. Located in a building built in 1885, Yesterdays Antiques & Collectibles has all the charm of the old downtown, with up-to-date renovations. Carry antiques and vintage, but also new collectibles and gently used items and items on consignment. Open Tues-Fri 10-6, Sat 12-5. For more information call 937-322-8044. You'll find over 200 antique dealer booths and showcases covering 30,000 square feet of show room space. Spend a day browsing thousands of quality antiques and collectibles. The AAA I-70 Antique Mall is a state-of-the-art antique show room, fully air conditioned, heated, carpeted and handicap accessible. Plenty of parking means that no matter what you drive or tow we have room for you. Just off I-70 and SR41. Open daily from 10am-6pm. With hundreds of thousands of antiques from furniture, toys, glass, china, advertising, rugs, and clothing. Dealers travel from all 50 states, Canada and England to acquire the finest antiques. We are handicap accessible and pets are welcome anytime! Offers 116,000 sq. ft. state of the art facility fully carpeted and climate controlled with over 650 dealers from over 20 states, bringing high quality antiques and collectibles from all parts of the U.S. and abroad. Specialize in the lampshades for antique lamps. They have 5000 lampshades in stock including glass, silks, all types of fabric and hardbacks with prints. Trained staff will help find the perfect shade for your lamp. Bring in lamp bases for proper fitting. Located just 5 minutes from the antique malls on the Historic National Road (Rt. 40) just east of Springfield. The Springfield Antique Show and Flea Market has been a favorite for over 25 years. Three times a year, in May, July and September, the Springfield Antique Show and Flea Market holds its famous Extravaganza. The extravaganzas are some of the largest markets held anywhere in the country and draw dealers and customers from around the world. Located 7 miles south of Springfield on the corner of Route 72 and Route 343. 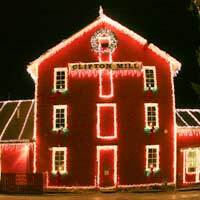 Among the many attractions in the area are several historic buildings, a grist mill, 2 antique shops, Clifton Gorge and John Bryan State Park. Part of historic Clifton, Weber's Antique Mall was established in 1965. Clifton is one of the best places in Ohio to visit for fine antique furniture and accessories. The minute you walk into our restaurant you'll know you are home! For over 25 years Ryan's has been committed to serving our customers hot, fresh and delicious food in a friendly, family-style atmosphere. You'll find a selection of exceptional food, served by friendly people that will satisfy just about any appetite. When you talk to a resident of Springfield and ask them about Schuler’s their eyes flutter and a smile comes over their face instantly. It is as if they have just eaten something delicious. Schuler’s Bakery has been giving people that expression for 72 years. There always seems to be a busy parking lot but the service is fast. Doughnuts are made through-out the day and if you time it just right they might even be warm. Since 1935 the Schuler family has run the shop presenting Springfield with an assortment of breads, butter rolls, cakes and pies. Schuler’s Bakery is as they say “The Home of Homemade”. The first 4-H Club was established in Springfield in 1902. A. B. Graham, the superintendent of the Springfield Township Rural schools, established the Boys and Girls Agricultural Experiment Club on January 15, 1902.The first meeting of the new club was held in the basement of the Clark County Courthouse, and claimed to be the nation's first farm club for young people. A few years later the organization changed its name to the 4-H Club. From 1916 to 1926, 10 automobile companies operated in Springfield. Amongst them: The Bramwell, Brenning, Foos, Frayer-Miller, Kelly Steam, Russell-Springfield and Westcott. The Westcott, know as the car built to last, was a 6-cylinder, 4 door sedan manufactured by Burton J. Westcott of the Westcott Motor Car Company. Burton and Orpha Westcott however, are better known for having contracted the world renowned architect Frank Lloyd Wright to design their home in 1908 at 1340 East High Street. The Westcott House, a 2 story stucco and concrete house has all the features of Wright's prairie style including horizontal lines, low-pitched roof, and broad eaves. It is the only Frank Lloyd Wright prairie style house in the state of Ohio. The property was purchased in 2000 by the Frank Lloyd Wright Building Conservancy (Chicago, IL), and as part of a prearranged plan, the house was then sold to a newly formed local Westcott House Foundation. The Westcott House Foundation managed the extensive 5 year, $5.3 million restoration, the house was fully restored to its original glory in October 2005, when it officially opened to the public for guided tours. Asa Smith Bushnell was born September 16, 1834 in Rome New York. At age 11 the Bushnell family moved to Springfield Ohio. The family was deeply involved in the Underground Railroad movement and his cousin Simeon Bushnell was arrested in 1858 for his involvement in the Oberlin-Wellington Rescue of run away slave John Price. In 1857 Asa Bushnell married Ellen Ludlow and began to work as a partner in his Father-in-law's drug store. Early in 1864 Bushnell formed a company of Springfield men for the civil war effort. The men of Company E in the 152nd Ohio National Guard infantry elected Bushnell captain and were stationed in Virginia and Maryland. With the end of the war Bushnell increase his business interests in agriculture machinery as well as becoming the President of the First National Bank. He invested in new industries of urban rail and telephone. He also became active in the Springfield Republican Party. Bushnell climbed the ranks of the party and in 1896 he was elected as Governor of Ohio. He served in this capacity during the Spanish-American War and was proud to say Ohio sent the first volunteers to fight in that war. 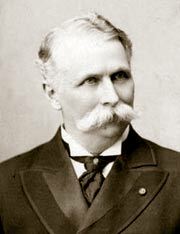 Governor Bushnell served 2 terms and left office in January of 1900. In that year he sold his Agricultural Machine business to International Harvester and continued his other business interests in Springfield until his death January 15, 1904. Asa Bushnell is buried in the Fernclift Cemetery in Springfield Ohio. Springfield was also the birthplace of James Rhodes, the 71st and 63rd governor of Ohio.